At the time of writing this post I have walked and hiked over 300 miles in my Hi-Tec Eurotrek WP Boots and worn them almost exclusively as both my daily walking shoe and on a 100 mile backpacking trip along parts of the Hadrians’s Wall Path and the Pennine Way. They have encountered rain, mud, slippery rocks, bogs and streams as well as tarmac. So how did the Hi-Tec Eurotrek WP Hiking Boots fair? First let’s see what Hi-Tec themselves say about their boots. Now I don’t normally go by a manufacturers description when buying hiking gear as I prefer to ask my friends on Twitter, and other social networks, their opinions. After all, these folk (and I include some of you reading this) are out there hiking in all conditions in all sorts of gear, so who better to ask right? However, in this instance, I didn’t ask for anyone’s opinion as I was asked to review these boots by OutdoorWorldDirect, an outdoor clothing a gear retailer based in the UK, after they contacted me via their Twitter account. The remit was simple – I would be sent a pair of low-mid price pair of boots of their choice free of charge and then I was to give an honest review after a long term test of the boots. So after receiving the men’s Hi-Tec Eurotrek WP Hiking Boots I was intrigued as to what Hi-Tec themselves say about their boots and the above statement certainly seems to tick the right boxes for a hiking boot. Now these boots have been around for a number of years so Hi-Tec must be confident in their claims and their sales must be robust – we all know boot manufacturers stop producing boots that don’t sell – but is the statement accurate? Out of the box the boots look good with their dark tan colour and black protective toe and heel rubber bumper and padded heel collar (see first image above). You can tell instantly that the leather uppers are coated to help with waterproofing and this does tend to give the boots a ‘synthetic leather’ look, but this doesn’t detract too much from their aesthetics. The Hi-Tec Eurotrek WP Hiking Boots do come with a removable sock liner, but I left this in for the purpose of this review. Trying the boots on for the first time with a pair of medium weight hiking sock they felt reasonably comfortable although I couldn’t tighten them as much as I might like – there is just not enough give and flexibility in the boot, either from the coated leather or the lacing system. I figured this might be due to the fact that the boots were brand new and needed time to stretch a little first and wasn’t overly concerned as the boots initially fit my (UK) size 9 feet quite well. My feet are quite broad at the toe and fairly narrow at the heel – more so than the average foot – so I was pleasantly surprised at the initial comfort of the boot. I then went for a 6 mile walk along tarmac pavements and damp grassy rights of way across fields in my local area and again was pleased with the ‘out of the box’ comfort of the boots. I didn’t feel ‘hot-spots’ anywhere on my feet and ankles and the thickness of the soles absorbed the shock of rigid tarmac. The boots supported my heel reasonably well and didn’t pinch my toes and although they felt a little inflexible the boots weren’t too heavy and cumbersome. Over the next couple of months I wore the boots almost daily, whether walking to the shops along tarmac pavements or walking in my local woods and fields across grassy pathways and muddy byways and discovered the boots didn’t really ‘break in’. This wasn’t too much of a problem as the initial comfort of the boots remained, but I was expecting the boots to feel more comfortable as time wearing them increased. During this period I walked in both dry weather and wet weather and although the walks didn’t tax the boots in terms of rough terrain, steep inclines and descents etc. I am happy to say the boots kept my feet blister free and dry. My feet didn’t overheat and for a budget boot for use on occasional walks the Hi-Tec EuroTrek WP Hiking Boots are a good choice. But how do they cope with more serious hiking conditions? 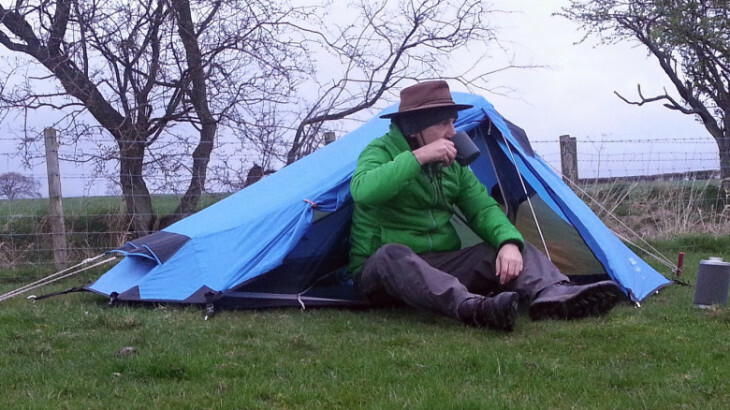 I wanted to try the Hi-Tec Eurotrek WP Hiking Boots on a long-distance, multi-day hike and the opportunity arose when I decided to walk approximately 100 miles from Carlise to Kirk Yetholm over 5 days. This would give the boots a good test of comfort and durability over different terrain, in different weather conditions and with multiple days of constant wear. I would also be carrying a fully loaded backpack and I was looking forward to seeing how the boots comfort stacked up when under load. The first day out I hikes around 25 miles along the Hadrian’s Wall Path in sunny and windy weather along well trodden grassy fields, rocky trails and occasional tarmac pavements and during the last 10 miles of the day’s walk I had a few short, but steep rocky inclines to tackle, but the boots coped well under these conditions and I didn’t encounter any over-heating of my feet, hot-spots or blisters. I had the boots fully laced and the cushioned heel and tongue kept me in reasonable comfort. I was glad to take the boots off at the day’s end, but then after hiking 25 miles carrying 40lbs on my back that’s not surprising! It was on the second day out that I began experiencing problems. I had joined the Pennine Way at Steel Rig and I encountered the first of a series of long ascents and descents I would need to hike over during the next 4 days. As I hiked up the first long steep incline I felt the left boot pressing against the top of my large toe and over the next few miles this began to cause discomfort. My boots were laced quite tightly so I loosened them off a little, but I could feel the pressure of the boot against my toe wasn’t lessening. I changed socks to see if this would help, but it didn’t. Now I had already walked over 200 miles in these boots on day walks prior to this multi-day hike without discomfort so I examined the boots to see what was causing the problem. The image above shows the Hi-Tec Eurotrek WP Hiking Boots after over 4 months of wear and over 300 miles of walking and hiking. Look in good condition don’t they? Indeed the boots clean up really well due to the water-proof coating applied to the leather uppers, but it is that same water-proof coating and the quality of the leather itself that is the cause of the problem. In the above photo, the left image shows the boot placed flat on the ground – notice there is very little creasing across the boot where the toes bend? In the image on the right you can see what happens to the boot when it is bent to simulate the bending of the toes where they join the foot when walking uphill. The boots don’t crease as they should – they ‘fold’ instead. It is this folding that causes a ridge to form inside the boot that rubs against the top of the toes. The problem is simple – the boot’s leather isn’t pliable enough. The boots don’t mould to the foot. Now for occasional day walks along gentle gradients this wasn’t a problem, but for hiking in hilly or mountainous terrain the lack of pliability is a big issue. So, now I knew what the problem was I applied a blister plaster to the affected area and carried on hiking. Over the next 4 days I hiked through rain, bogs and wet grass, wading through small streams and over wet rocks and the Hi-Tec Eurotrek WP Hiking Boots coped easily. The waterproof coating really does shed water well and the moulded sole is robust with a good wide tread that grips very well. I have spent a lot more money on boots that had less grip than these boots have, and the Hi-Tec’s cost less than £50! Water simply doesn’t get into these boots and wearing ankle gaiters I was able to cross streams easily and my feet remained dry. My feet also didn’t sweat inside the boots much either which surprised me as I couldn’t work out how, with such robust waterproofing, the boots allowed my feet to breath. That’s not to say I wasn’t glad to take my boots off whenever I rested – it’s good practice to air your feet whenever you take a rest stop – and these boots are not the lightest in the world. But neither are they overly heavy. The soles of the boots are quite stiff and, without a boot liner, would be very hard on the feet, but the sock liner that comes with the boot is adequate and absorbed most of the shocks. And because of the thickness and rigidity of the boot’s soles you don’t get much feedback of the trail to your feet which, for a lot of people is fine, especially when walking over gentle terrain, but for the serious hiker this rigidity and lack of feedback is a problem. Again, it is the inflexibility of the materials used in these boots that let’s them down for long distance hiking. For the day walker and weeken backpacker the Hi-Tec Eurotrek WP Hiking Boots are a good boot and should last a few years and for the price represent good value for money. For the more serious hiker the boots are too inflexible. *Disclaimer.I was asked to review these boots by OutdoorWorldDirect after they contacted me through their Twitter account. I was sent the pair in this review gratis with the understanding that I would give them a long term test before reviewing. All opinions are mine based solely on my experiences and this review is in no way influenced by OutdoorWorldDirect. Feature, Gear Reviews, Reviews Boots, Hi-Tec, leather, men, Review, waterproof. permalink. PilgrimChris Dot Com is moving home!